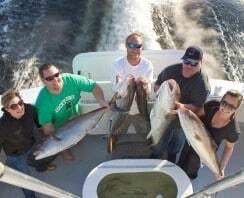 No Alibi Fishing Team 2014 Cobia Season was one for the record books | Destin FL Fishing Charters - No Alibi Charter Boat Red Snapper, Shark, Cobia, Grouper & More! 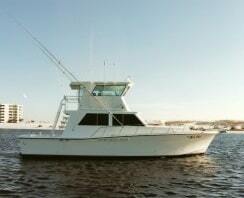 No Alibi Fishing Team took prize money and trophies home in 4 out of the 7 Cobia Tournaments entered. The Cobia migration that occurs every spring in the North quadrant of the Gulf of Mexico was quality over quantity this season. The Cobia were few and far between, but we made the big ones count. Cobia fishing takes patience and hunting skills. You maneuver slowly East to West and back again “hunting” from the Tuna tower on the top of the boat. When a Cobia is sighted, then the race is on and the crew gets to work. Mates cast eels and jigs in hopes of the big bite. 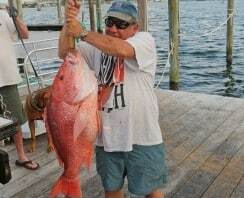 Finally, she is hooked and the angler battles to get her to the boat. The fight in a Cobia is unlike any other fish in the world. It is a must try for any avid outdoors man. We took 1st place in the Lingapalooza which is hosted by Destin Charter Service located directly behind the Fisherman’s Wharf Restaurant on the Destin, Harbor. We took 1st place ladies division at the Harborwalk Cobia Tournament hosted by Harborwalk Marina which is located in Harborwalk Village. We took 2nd place ladies and 3rd place juniors in the Cobia World Championships hosted by Harbor Docks Restaurant. We took 3rd place in the Crab Cruncher Classic hosted by Harbor Docks Restaurant. We had an amazing Cobia season and are looking forward to many more with the No Alibi Fishing Team. All our anglers, spotters, and fishing crew were amazing. Big shout out to all the crew especially our lady angler, Heather Browning. Awesome job girl!! Show those boys how it is done.